Many travelers are on a quest of sorts to discover a destination by getting “off the beaten path.” Although I think the concept is a misnomer, I also believe travel experiences vary dramatically depending on how we do our research and who we spend our time with on the road. Staying in hotels hardly incites a “local” experience. In order to feel like a local while you travel, it's best to live like a local. This usually means living in a local's home, or along side locals in a volunteer facility. Volunteering in trade for your accommodations can take many different forms. I've milked goats, painted murals, designed marketing plans, run hostels, cooked meals, taught conversational English, and more — all in trade for my accommodations (and sometimes meals too). Accommodations for these “jobs” ranged from staying in the home of a local who needed some extra help to staying in fully equipped multi-volunteer facilities. From rustic to luxury, these gigs run the gambit. How to Travel Full-Time for $17,000 a Year (or Less)! Hospitality exchange sites connect travelers with local hosts who are willing to open up their homes to guests. The informal term for this is "couch surfing," coined by the namesake CouchSurfing website. And it's about more than staying on somebody's couch; with forums and chapter meetings around the world, it can be a great way to meet locals who are also enthusiastic about travel and eager to exchange ideas and cultural values. But couch surfing is only one such site for finding opportunities to stay with locals for free. You'll find a whole list of local accommodation options here. Similar to booking a hotel, you can use online services to book a local's apartment or house (or a spare room, tent space, and other incantations of accommodations). If you are sharing common space with the owner, there is usually ample opportunity to tap into their local knowledge as a bonus. For more information on rental services, check out Got Space? Make Money and Meet Travelers With Short-Term Rentals. Or you can get a slice of local life by house-sitting or pet-sitting for a local, which entails varying degrees of responsibility in trade for free (or almost free) accommodations (check out 10 Tips for Landing the Perfect House-Sitting Gig). Would you like to house-sit, but also have somebody to take care of your home while you're away? Then a home exchange is a perfect route to free accommodation and peace of mind that your place is in good hands. How do you meet locals while you're traveling? With possible cultural or linguistic differences presenting challenges, you need to find people with whom you have common ground. Here are a few ways. Do you have a hobby or pastime? Look for local online forums and member groups at your destination to see if you can attend a meeting or event while you're there. Your shared interest immediately creates common ground to get to know people quickly and easily. Between Rotary clubs and rock-climbing crags (and everything in between), I've met quite a cross-section of locals in many places I've visited — and made friends I still keep in touch with. If you have a question or two that you'd like to get the local female take on (about anything from local customs to a good place to eat), female travelers can check out HerMail, which connects locals with travelers coming to the area. (Sorry — this is a girls-only club!) Although it starts with a question, you might end up meeting up or getting an informal tour or even a place to stay. I took an informal poll in writing this article, asking other travelers how they meet locals on the road. And the place to be is the pub! You'll find a broad mixture of people at any watering hole around the world (noting that it's good to be cognizant of the area and how safe it is), and a few pints of beer do wonders for developing camaraderie. People are generally tired of sifting through guidebooks and being herded on whitewash tours when they travel. They want a “local” experience for minimal time, money, and research invested; and who better to provide this experience than a bona fide local? Use SnappyGo to get locally developed custom itineraries. You'll be connected with a local advisor, and for an average of $30-75 (depending on the length of your trip and depth of advice you want), you'll receive customized points of interest, hotel suggestions, restaurant suggestions, and insider tips — all tailored to your specific travel profile, and with relevant links and contact information provided. For custom themed tours, check out HipHost. Browse locally developed custom tour itineraries with themes ranging from "Beer & Chocolate" to "Running" to "Architecture" to "Girl's Night Out." Or you can post for a custom tour request and be matched with a local guide who is capable of meeting your custom requirements. The cost of the tours varies depending on the activities involved, but the guide's time is usually worth $20/hour (plus an administrative fee for HipHost). Shiroube is more open-ended; connect with an advisor who matches your destination and travel interests, then correspond and strike a deal. Services provided can vary from getting answers to basic questions (which is often provided for free) to receiving a fully guided (paid) tour by a local. Similar to Shiroube, Pangea Pal is a new site designed to connect travelers with locals to strike their own deals for whatever tour-related services are on offer/request. For information on what it's like to earn extra cash as a local tour guide on your own turf, check out this article about becoming a tour guide in your hometown. The most common way to find local businesses or popular places to go is the Internet. Here are some apps and websites commonly used to get the local scoop. (Note: This is far from an exhaustive list, as crowdsourcing becomes more common every day and new resources are popping up everywhere). Use Yelp and Google+ Local to find businesses based on locally submitted reviews. Both are available for smartphones as well. LocalMind is an app to tap into the real-time local scene. If you're headed out (to a restaurant or bar for example), you can find out what's happening in real time from other LocalMind users who are there now. If you're headed for Europe, use Spotted by Locals to get city guides and local tips. OK, it's your turn to spill the beans. Have you used any of the above services, or do you know of another way to tap into the local scene while traveling? My biggest tip is to find out where students live/hang out, for access to lower-priced but authentic local food. I've found that even in the priciest cities like London, Tokyo and Milan, if you walk around near a city university you're likely to find really great food at a lower price, and not just chains. Case in point, around the corner from the Goodge St tube station in London, you can get fantastic freshly-made whole pizzas for as little as £3.50, and a few stores down is a Chinese/Thai veg buffet for £4. 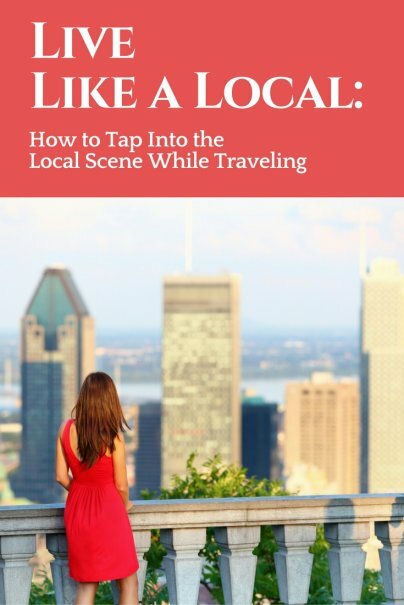 Great tips -- enjoying the local flavor of a community is all about getting off the beaten path and being immersed in the "dives" and local haunts that give each place texture (instead of the chain stores and restaurants that are such a large part of the world now). Thanks for the tips! Not only does getting off the beaten path allow for a more authentic and rich experience, but it will also ensure you save money on the touristy spots and restaurants that majorly jack up prices. I love the idea of staying with a local family, or even in an apartment that rents out to travelers- this was you can buy local market food and cook meals yourself. Talking to locals and asking around for hidden spots is much better than visiting the concierge at a hotel. Great tips!